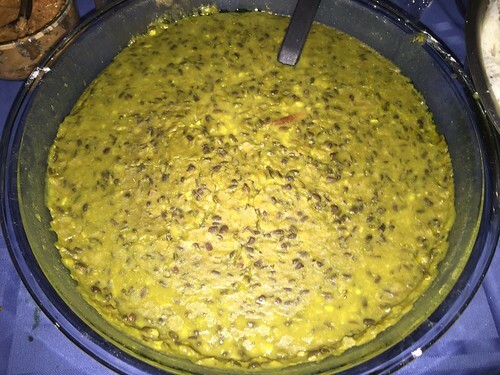 The core of Nepalese food can be summed up in one very simply named dish: daal bhat, meaning "legumes [and] rice." Along with tarkari — a spiced dish we'd probably call a curry — and achar (pickles), this is the dish that many people in Nepal eat pretty much every single day. Fortunately, there's variety to be found in the type and preparation of the dal and the tarkari, and a wide variety of achars can bring all sorts of flavors. Characteristically, I tried to capture as much of that variety as possible with two daals, three tarkaris, and four achars! Now, Nepal is a geographically and ethnically diverse country, ranging from river plains to the highest mountain in the world, and with a whole wide variety of distinct cultures (Nepali is the home language of less than half of the population.). Accordingly, there are indeed other kinds of foods eaten, such as a variety of grilled meats, and perhaps most famously dumplings. 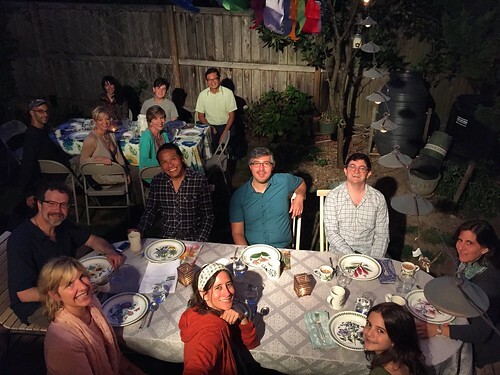 We took advantage of fine weather for a late-September outdoor meal. It was convenient that we could use the new outdoor wok burner, because we needed all the cooking devices we could get to cook so many dishes. Apologies in advance about the photos, our good camera was being repaired so we had to rely on an iPhone in far less than ideal lighting conditions! Pretty similar to dumplings you see in many Asian countries, though rather than the half-moon shape typical of potstickers, they're made into round purses and also tend to have more filling per piece. There are at least as many filling recipes as there are people who make momo, ranging across just about every type of meat and vegetable you can find in the area; we chose to go with a chicken version to accommodate dietary preferences. Frankly, vegetables made up the bulk of the filling anyway, and I'm glad we had a milder meat so the flavor of the curry and the electric zing of the Szechuan peppercorn could come through. Daal is a whole lot more than that kinda soupy yellow thing you push to the side in favor of the tastier stuff at the Indian restaurant. (Well, at least that's what I tend to do with it.) There's a whole lot of lentils, peas, and beans that can be gently simmered — more often than not they're split, so the cooking time is reduced —and flavored into a protein-packed stew that's just begging to be paired with rice. Amidst a whole lot of options, I chose the pigeon-pea version, rahar ko daal, because it's apparently the "king of daals" in Nepal, and maas ko daal made with what's known as black gram because it looked pretty and seemed to offer a richer flavor. I was a bit surprised to find that I preferred the more pedestrian-seeming pigeon-pea one, which had a brighter flavor with warm spice from the cinnamon and cumin. The dark one was fine too, but I felt like it was a bit too heavy, perhaps if it had a personality I'd call it "brooding." (To be fair, I didn't have the jimbu herb the recipe called for, but since it's in the same family as onion I don't think my concern would have been addressed). Nepali vegetable curries aren't quite as richly spiced as many Indian ones, rather the flavors of the individual spices seem to me to come through more: the maple-like nuttiness of fenugreek, the sharp whiff of mustard oil, the zing of the Szechuan peppercorn. 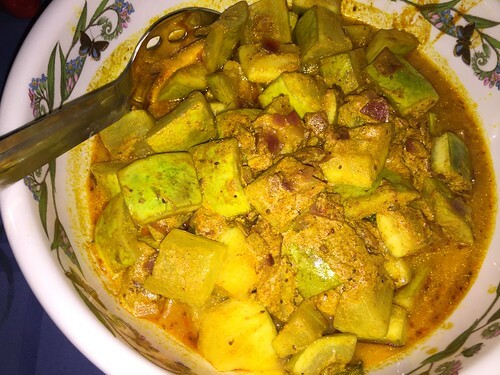 It's a nice contrast with the more harmonious flavors of the daal, and crisp or firm vegetables like the bottle gourd also make for a flavor contrast. I shoulda thought to start the achars earlier. I knew that some of them take a good long while to get all good and funky, yet I really didn't get to it until a few days before. Fortunately, there was plenty I still could do, and jars from the store took care of the rest. The ginger achar was not only the tastiest and most versatile, but the recipe ends with perhaps one of the best declarations I've read in a recipe: "This is the best thing to eat during lazy hours." The gundruk was really intense and funky, I only made it because I shockingly found a container of this salty, fermented, dried vegetable at the store, and whoo-boy, that's a bold one. Tomato achar is a really nice one that's found throughout the Subcontinent but surprisingly hasn't made its way onto restaurant tables like mint and coriander chutneys. I think the condiment, which is like a chunkier, more spiced, less sweet version of ketchup, would go over well. A lovely, gentle way to end an intense meal after all those spices and textures. A just-barely-holding-together fudge of ground cashews with a judicious dosing of cardamom.